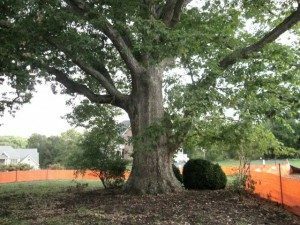 Contractors have a vested interest in preserving the existing trees on a construction site. Many local governments require a tree preservation plan that preserves as much canopy as practical. But the real benefit to preserving mature trees is that it results in higher property values and faster sales. Buyers and tenants are willing to pay up to 15% more for properties that have mature trees. Saving trees just makes good sense. There must be a balanced approach between two dynamics when it comes to new construction and tree preservation. Contractors want to ensure there’s enough room for equipment, supplies and tradesmen to do their work efficiently, while the arborist must preserve as much of the tree’s root zone as possible. In order to achieve this balance, the arborist will study site plans and walk the site. He will determine which trees are not only worth saving, but also whether or not they have a viable chance to survive the construction process. Tree specie, condition, and proximity to the limits of clearing are all factors that go into their recommendations. 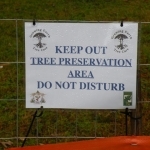 Tree preservation plans usually involve installing tree protection fencing along the edge of the preservation area with clearly labeled signs. Other recommendations may include root pruning along limits of clearing to make clean cuts rather than letting bulldozers rip and tear at the roots. Pruning may be necessary to provide clearance from construction work and equipment access ways. 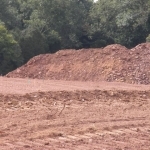 In areas where heavy equipment must pass during the construction, it helps to place a thick layer of wood chip mulch over root zones. Other preservation measures may also be necessary.